Pixie, all shiney and clean after her bath. I had everything ready for the farrier last night; a bucket of water for him to use to form the cast, the mats swept clean, hosed down and dried, Bruno’s bell boot off, his hoof clean and Bruno, himself, worn out from a day in the hot sun. I was working so hard I never noticed my phone. There was a message that tomorrow morning would be better. Oh, well! When your farrier is making an over one hundred mile round trip for the third time in less than three weeks, you go with grateful, no matter when he shows up. Bright and early this morning, with Lauren and Feather already seriously at work in the arena, Roland pulled in. He had been here with the vet just two weeks ago. They had hatched a plan to use a heartbar shoe with a pad between the hoof and shoe but then…there’s more, they used cast material (like on a broken arm) to wrap around Bruno’s hoof. The idea was to drive the hoofing nails into the cast instead of the fragile hoof wall. Dr. Criner gave it three weeks. Much to my horror, it lasted only ten days. But while it was on Bruno was 99% sound for the first time in 277 days (to be exact-that’s when he had surgery)! It was pretty amazing to see him go so well. New plan today!! 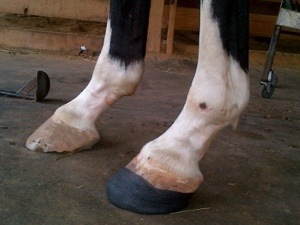 Shoe him with a straight bar shoe, add the equi-Pak (it reminds me of silicone putty you use to caulk a bathroom) to create some padding and then cast the hoof. We hoped it would last a little longer. Since Bruno needed his other feet done, Roland trimmed them all. Making it another first, as this was the first time since we have owned him he is being set with working feet! It is get over the surgery and move on, big guy, time. The long toes so many of you have commented about are gone. He has a great pedicure, new shoes and I pray we have a Horse who is completely ready, willing and able to return to work! Do you have any idea my excitement when we actually jump this horse, this horse upon so many dreams we have built-all without EVER seeing him jump even once. I know I may be in for a big let down…but I so think he can do it! 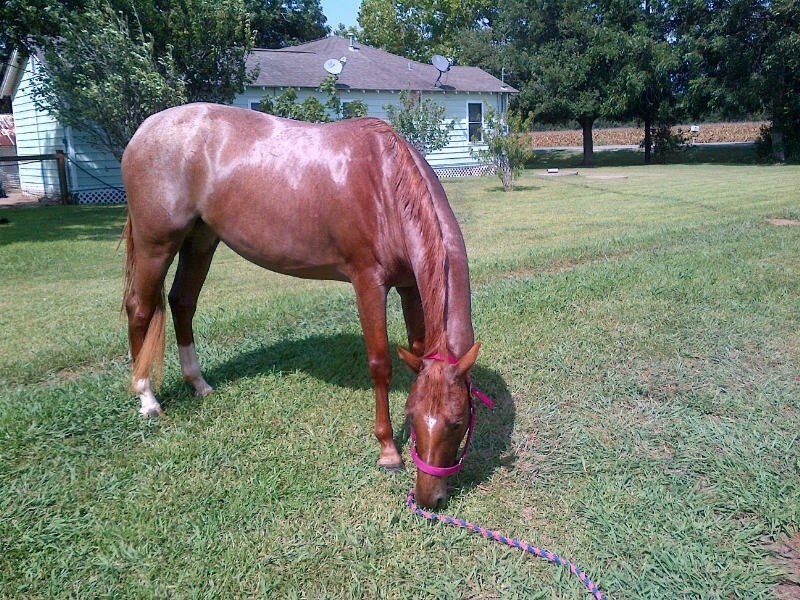 After Bruno’s pedicure, I dragged lil Pixie out of the pasture for a bath. We have not paid enough attention to this one since she arrived from Florida. I washed and conditioned her long, beautiful tail. I scrubbed her body and legs. I was rewarded with pretty, silky pony! Now, I am headed in to clean up from my day of pedicures and baths. Thanks for riding along! I see some trot poles and small Xes for these two soon. It’s going to be fun!! This entry was posted in A Bruno Story, The horses of Six Meadow Farm and tagged casts on horses, farrier, Lynn Criner, OTTBs, Roland Salazar, RSPI, shoeing, special hoof problems by Exechorseluver. Bookmark the permalink. I will see him go tonight! Fingers crossed!